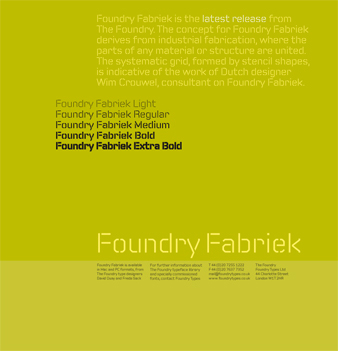 The concept for Foundry Fabriek derives from industrial fabrication, where the parts of any material or structure are united. The systematic grid, formed by stencil shapes, is indicative of the work of Dutch designer Wim Crouwel, consultant on Foundry Fabriek. Foundry Fabriek started as a commission, through Wim Crouwel who recommended me to Interior and Industrial design consultants, Kho Liang Ie. They were designing an interior section of a new office building for the insurance company, Interpolis in Tilburg , South Nederlands. I was commissioned to create a stencil typeface based on Foundry Gridnik to be laser cut into steel panels. The panels where then assembled to screen off a small meeting room. The text cut into the panels are ‘uplifting, inspirational’ poems! All the inside angles had to have a radius as the laser could not cut into the corners easily, the outside angels could be left square. The final result was satisfactory but I felt there was something unresolved in the way the end diagonals of the A, V, W, X, Y, w, x, y, terminated they seemed to fight against the vertical stress of the letters which is enhanced by the vertical cuts of the stencil. I did not see it for several months after the job was completed. It was only in discussion with another young designer friend, Kasper Andrerson sketching in the Café Loosje Locaal in Amsterdam that he suggested cutting the outside of the diagonal ends off. It did not work, the letters looked weak at the ends so I added a straight on the inside too, that worked. Crouwel’s involvement was minimal but he was very pleased with the end result. I wanted to name it Foundry Sjabloon, Dutch for stencil but everyone felt it was too obscure and eventually we released it as Foundry Fabriek, Dutch spelling of course!